In celebration of the birth centenary of Vicente Manansala, the Ayala Museum, in partnership with the Filipino Heritage Festival, presents the exhibition, Images of Nation: Vicente Manansala as Social Realist on May 26 at the Ground Floor Gallery of the Ayala Museum. To complete the robust profile of this larger-than-life figure in Philippine art, Ayala Museum will highlight the works that depict the social realist sensibility of one of the leading NeoRealist painters. Vicente Manansala (1910 - 1981), National Artist for the Visual Arts, witnessed many pivotal events in Philippine history in the twentieth century. The artist was born during the American period, survived World War II, struggled through the postwar years and died during the peak of the Marcos dictatorship. In contrast to the brilliant landscape and genre paintings rendered in the artist’s signature transparent cubism, the paintings gathered for this exhibition show a somber and darker temper and palette. 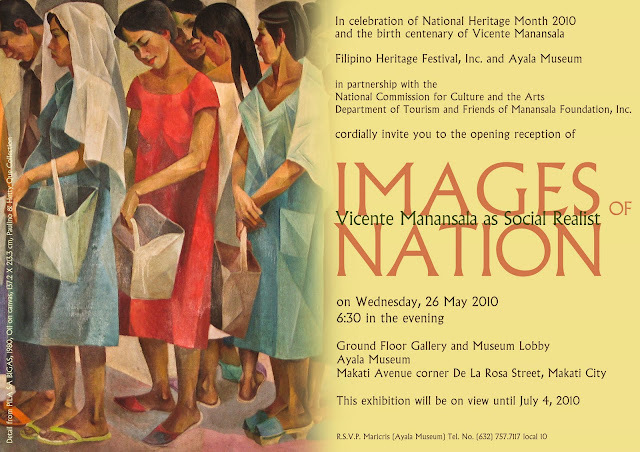 Images of a Nation: Vicente Manansala as Social Realist is part of the National Heritage Month’s annual celebration presented nationwide by the Filipino Heritage Festival. The exhibit was also in partnership with the National Commission for Culture and the Arts, Department of Tourism and Friends of Manansala. The exhibition will be open to the public until July 4, 2010. For details and inquiries on this exhibition, please call (632) 757-7117 to 21 local 28 or visit www.ayalamuseum.org. Ayala Museum is located at the corner of Makati Avenue and De la Rosa Street, Greenbelt Park, Makati City.